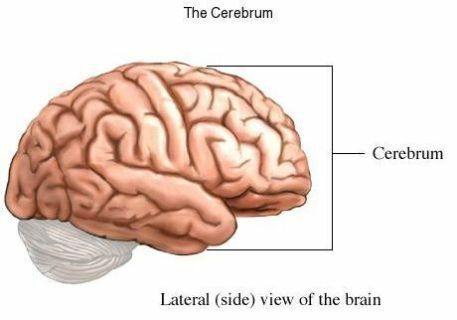 The cerebrum is the largest part of the brain. It is made of a left and a right section. The right side of the brain is in charge of the left-side of the body. It also does some of our thought processing, help us know body position, and judge space and distance. A right brain stroke happens when the blood supply to the right side of the brain is interrupted. Blood brings oxygen and nutrients to brain tissue. When blood flow is stopped, the brain tissue quickly dies. There are 2 main types of stroke: ischemic and hemorrhagic. An ischemic stroke is the most common type of stroke. A clot from another part of the body like the heart or neck. The clot breaks off and flows through the blood until it becomes trapped in a blood vessel supplying the brain. A clot that forms in an artery that supplies blood to the brain. A tear in an artery supplying blood to the brain—arterial dissection. 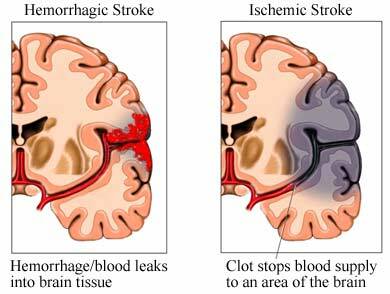 A hemorrhagic stroke is caused by a burst blood vessel. Blood spills out of the broken blood vessel and pools in the brain. This interrupts the flow of blood and causes a build up of pressure on the brain. Race—People of African American, Hispanic, or Asian/Pacific Islander descent are at increased risk. Age: Older than 55 years of age. Symptoms occur suddenly. Exact symptoms will depend on the part of the brain affected. Rapid treatment is important to decrease the amount of brain damage. Brain tissue without blood flow dies quickly. You will be asked about your symptoms and past health. A physical exam will be done to look for muscle weakness and movement difficulty. Vision and speech will also be checked. Blood tests can also help determine if there is a bleeding problem. Oxygen therapy may be needed. Eat more fruits, vegetables , and whole grains . Limit dietary salt and fat . Increase your consumption of fish. Limit alcohol to 1-2 drinks per day. Check blood pressure frequently . Follow your doctor's advice for keeping it in a safe range. Take aspirin if your doctor says it is safe. Keep chronic medical conditions under control. This includes high cholesterol and diabetes. Talk to your doctor about the use of a statins. These types of drugs may help prevent certain kinds of strokes in some people. Seek medical care if you have symptoms of a stroke, even if symptoms stop. If you use drugs, talk to your doctor about rehabilitation programs. Cassella CR, Jagoda A. Ischemic stroke: advances in diagnosis and management. Emer Med Clin North Am. 2017;35(4):911-930. Furie KL, Kasner SE, Adams RJ, et al. Guidelines for the prevention of stroke in patients with stroke or transient ischemic attack: a guideline for healthcare professionals from the American Heart Association/American Stroke Association. Stroke. 2011;42(1):227-276. Hemorrhagic stroke. National Stroke Association website. Available at: http://www.stroke.org/understand-stroke/what-stroke/hemorrhagic-stroke. Accessed November 8, 2018. Hemorrhagic strokes (bleeds). American Stroke Association website. Available at: http://www.strokeassociation.org/STROKEORG/AboutStroke/TypesofStroke/HemorrhagicBleeds/Hemorrhagic-Strokes-Bleeds%5FUCM%5F310940%5FArticle.jsp#.Vk3h%5Fk2FPIU. Updated April 26, 2017. Accessed November 8, 2018. Intracerebral hemorrhage. EBSCO DynaMed Plus website. Available at: http://www.dynamed.com/topics/dmp~AN~T115590/Intracerebral-hemorrhage . Updated November 28, 2018. Accessed December 11, 2018. Ischemic strokes (clots). American Stroke Association website. Available at: http://www.strokeassociation.org/STROKEORG/AboutStroke/TypesofStroke/IschemicClots/Ischemic-Strokes-Clots%5FUCM%5F310939%5FArticle.jsp#.Vk3ipE2FPIU. Updated April 26, 2017. Accessed November 8, 2018. Long-term management of stroke. EBSCO DynaMed Plus website. Available at: http://www.dynamed.com/topics/dmp~AN~T900125/Long-term-management-of-stroke . Updated June 4, 2018. Accessed December 11, 2018. Neuroimaging for acute stroke. EBSCO DynaMed Plus website. Available at: http://www.dynamed.com/topics/dmp~AN~T474350/Neuroimaging-for-acute-stroke . Updated April 13, 2018. Accessed December 11, 2018. Raychev R, Saver JL. Mechanical thrombectomy devices for treatment of stroke. Neurol Clin Practice. 2012;2(3):231-235. Stroke (acute management). EBSCO DynaMed Plus website. Available at: http://www.dynamed.com/topics/dmp~AN~T143427/Stroke-acute-management . Updated November 27, 2018. Accessed December 11, 2018. Subarachnoid hemorrhage. EBSCO DynaMed Plus website. Available at: http://www.dynamed.com/topics/dmp~AN~T116453/Subarachnoid-hemorrhage . Updated June 6, 2018. Accessed December 11, 2018. 2/7/2014 DynaMed's Systematic Literature Surveillance http://www.dynamed.com/topics/dmp~AN~T566761/Prevention-of-stroke : Bushnell C, McCollough LD, Awad IA, et al. Guideline for the prevention of stroke in women. Available at: http://stroke.ahajournals.org/content/early/2014/02/06/01.str.0000442009.06663.48. Accessed November 18, 2015. 6/2/2014 DynaMed's Systematic Literature Surveillance http://www.dynamed.com/topics/dmp~AN~T580145/Stroke-rehabilitation : Myint PK, Cleark AB, Kwok CS, et al. Bone mineral density and incidence of stroke: European prospective investigation into cancer-Norfolk population-based study, systemic review, and meta-analysis. Stroke. 2014;45(2):373-382. 6/2/2014 DynaMed's Systematic Literature Surveillance http://www.dynamed.com/topics/dmp~AN~T361037/Risk-factors-for-stroke-or-transient-ischemic-attack : Imfeld P, Bodmer M,Schuerch M, Jick SS, Meier CR. Risk of incident stroke in patients with Alzheimer disease or vascular dementia. Neurology. 2013;81(10):910-919. 8/11/2015 DynaMed's Systematic Literature Surveillance http://www.dynamed.com/topics/dmp~AN~T184935/Cardiovascular-disease-and-obstructive-sleep-apnea : Molnar MZ, Mucsi I, Novak M, et al. Association of incident obstructive sleep apnoea with outcomes in a large cohort of US veterans. Thorax. 2015;70(9):888-895.